← Maintenance and let’s begin! Sorry I’ve been gone for a while, but I’m sure you’d rather not have a blow-by-blow account (literally) of my struggle with the flu. Suffice it to say that actual influenza is no joke, particularly if you happen to have asthma. So… I’ve been spending a lot of time on the bike so far, on the trainer and commuting. I like the trainer more than the treadmill, so my training has been far more bike-centric. In January I did over 500 miles on the trainer and biking outside (studded tires help with that) and just 12.5 miles total running. At over 10 miles I almost covered more distance in the pool than on the treadmill. There are several principles when it comes to training. The first is the principle of specificity, which says that if you want to be a better cyclist, get on the bike and ride. If you want to be a better runner, run. If you want to be a better swimmer, swim. There’s not supposed to be much cross-over between any physical discipline. I’ve noticed in the past that a lot of running helped me on the bike some, but that cycling never really helped me run. A recent run taught me that conventional wisdom (and my own ideas) ain’t so wise! When the weather turned nice last Tuesday I thought I’d take advantage of the time I had during the kids’ Swim & Gym time to get 9 miles in. Recently I had been running in the 9-9:30 minute per mile range, and I really didn’t expect this run to be different. I got in a solid zone 3 range and decided to try an experiment. I kept my heart rate as close to 160 for the entire run to see what happened to my speed over the course of the run. In general, heart rate tends to drift, so at the same pace heart rate will slowly go up over the course of a run, and at the same heart rate speed will slowly decrease. The rate of this increase or decrease depends mostly on fitness level. 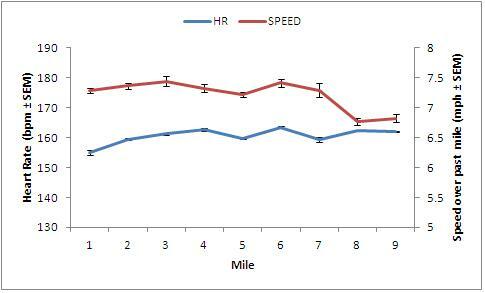 The more fit you are at a given distance, the less you drift. Joe Friel calls this coupling. When the data starts drifting, coach Friel says you are decoupled. By the rules of specificity drift should have started pretty soon, but….. The moral of the story: sometimes your training can take you places you (and conventional wisdom) didn’t expect you to go. This entry was posted in Training and tagged Cardiac Drift, health, healthy-living, principle of specificity, Run, Running, studded tires, Tempo Run, Training. Bookmark the permalink.